On the bench or in the field, you’ll have the right screwdrivers for your gun in one compact, go-anywhere package. 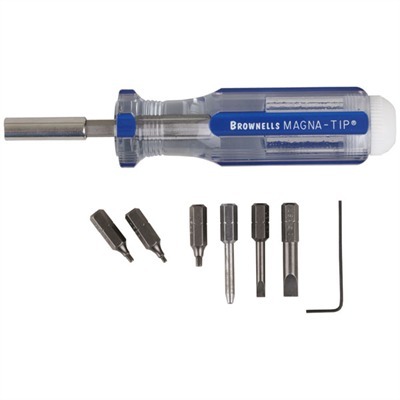 We precisely matched each gun’s screws to the correct Magna-Tip® bits to give you the best possible, blade-to-slot fit. Except where indicated otherwise, each set comes with a magnetic socket, Hollow Handle for easy, on-board storage of the bits. Six bits for disassembling magazine catch lock and mainspring housing, removal of slotted and Allen grip screws, and adjusting Bomar, Heine, and Novak sights, plus a .050" Allen wrench for adjusting XS sights. SPECS: 6-3⁄16” (15.7cm) long overall. 1¼" (3.2cm) diameter grip.